You are currently browsing the tag archive for the ‘Northern Virginia home sales’ tag. The D.C. housing market has been a shining light in an otherwise tepid economic picture for the region. Home sales prices are set to finish up for 2012 over 2011 — which will be the fourth year in a row that the region has enjoyed value appreciation. The chart below is for Northern Virginia home prices, which had a high average price of more than $525,000 for the summer and finished December out with more than $518,000. (The average home price includes all housing types – condo, townhouse and single-family). The December price is only 8.1% below the highest December price on record, which was set in 2005. The tortoise-speed appreciation over the years is actually a very healthy road to recovery, rather than the sky-rocketing fashioned appreciation of the mid-2000s. he usual trickle in open houses of the past). Home sellers can be assured of good traffic and a strong sale if their home is priced appropriately. Buyers are continually blessed with excellent mortgage interest rates. Give us a call if you need more information about your particular market. We can be reached at Weichert Realtors/McLean at (703) 821-8300. January 2013 – in like a lion! Home buyers are out in force in Northern Virginia. So far this month, there’s been a 17.4% increase in the number of contracts written compared to the same period January 2012. Nearly 1,000 buyers have put homes under contract in the counties of Fairfax and Arlington, and cities of Alexandria, Fairfax and Falls Church (the close-in burbs of Washington, D.C., for out-of-town readers). The D.C. market has continued it’s bullish temperament, since Congress came up with its agreement to avoid the fiscal cliff (at least for now). 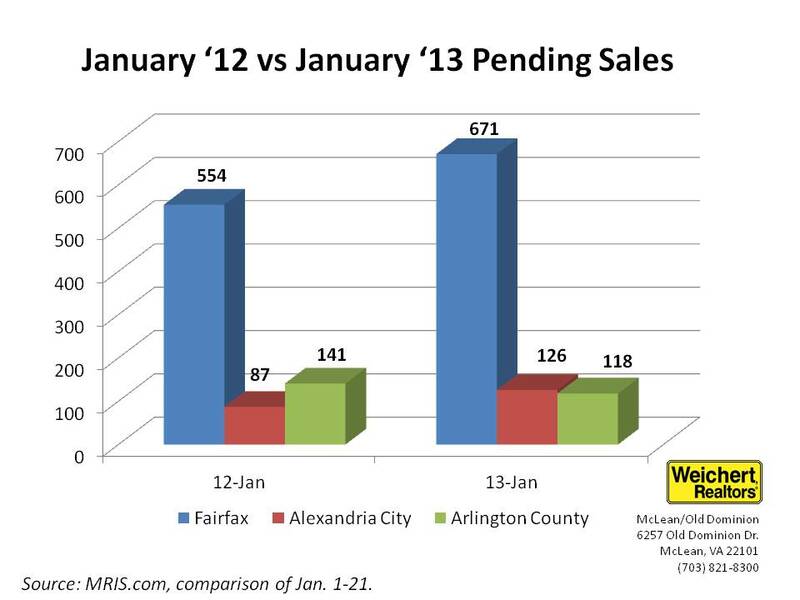 Pending sales are tracking ahead of January 2012 by 16% for Northern Virginia (Fairfax and Arlington Counties, cities of Alexandria, Fairfax, Falls Church. Job growth in the region, increasing rental rates and low mortgage interest rates are all three creating a perfect storm for the region. Need help navigating it all? Give us a call at (703) 821-8300 at Weichert Realtors in the McLean/Old Dominion office.